This Saturday is Big Hearts Day! On 30th March, as Hearts takes on Aberdeen at Tynecastle Park we’ll celebrate our work using the power of football to support the most isolated and vulnerable in our community. Big Hearts is delighted to offer a host of free activities for the whole family to enjoy prior to kick-off at 3pm. A team of 25 Big Hearts Supporters will be on hand across the Stadium with handouts and giveaways – it’s your opportunity to find out more about Hearts’ charity and how fans can get involved to support our work. We would like to thank our official event sponsor DPS Group for supporting this 4th Big Hearts Day! – Foundation Plaza: Keepie uppie competition, Balloon modelling, Drumming performance. Come along early to grab one of our free Big Hearts card wallets, useful to carry your bus pass or season ticket! 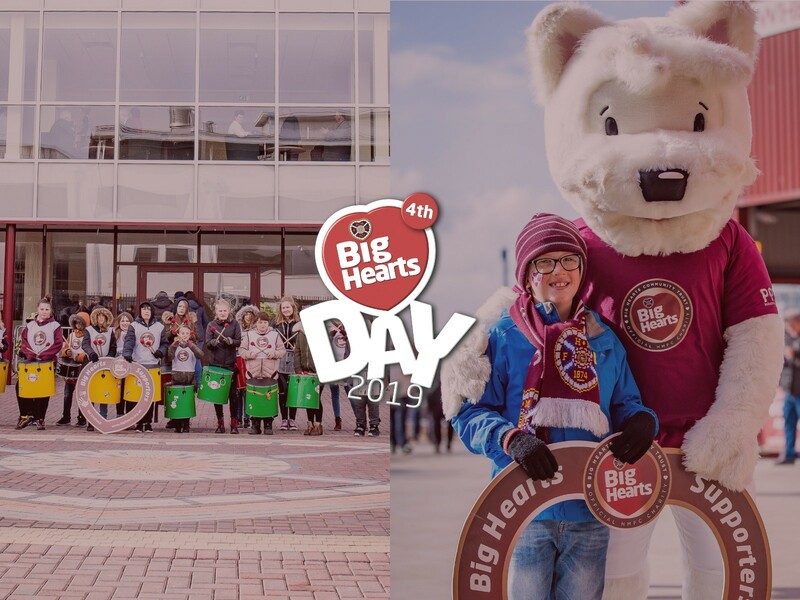 – Gorgie/Wheatfield Stands: Face painting, Balloon modelling and distribution of our free Big Hearts Day ‘Kids Special’ programme, with limited copies available! – Look out for our Volunteers across the Stadium to get our new Big Hearts badges, pose with our event photo board and find out more about our various projects! We are excited to announce that 10 young people involved in Big Hearts’ multicultural T.E.A.M project will take over the pitch at half-time, for a ‘beat the goalie’ competition with Jock the Jambo in between the posts! Share your photos to win a signed T-shirt! On Saturday, Hearts supporters are encouraged to share their photos on social media to enter our Big Hearts Day competition! Use #BigHeartsDay on Twitter, Facebook or Instagram to enter the draw for a chance to win a signed T-shirt, worn by 1st team players on the day.